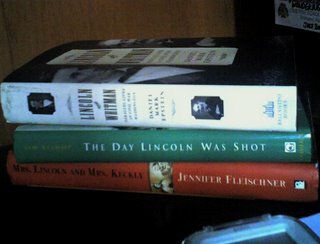 My finds on my last three visits to the Powerbooks sale: Lincoln and Whitman by Daniel Mark Epstein; Mrs Lincoln and Mrs Keckly by Jennifer Fleischer, and The Day Lincoln Was Shot by Jim Bishop. I’ve always had a general interest in American politics, particularly in what actually goes on in the White House, but only in a more contemporary setting. After reading The Devil in the White City (Erik Larson) and The Dante Club (Matthew Pearl), though, I'm finding early American life and politics a bit more interesting. PS: Alright, there’s more. To cap my little history-book binge, I also picked up an interesting volume written by former SC Justice Abraham Sarmiento, who apparently shares my fascination (at times obsession) with the trial and execution of Gat Andres Bonifacio. His book The Trial of Andres Bonifacio: The Appeal is about a fictional Supreme Court decision on an appeal (also fictional) of the court martial’s ruling finding Bonifacio guilty of “conspiring to overthrow the government and assassinate President Aguinaldo,” and which recommended his execution. It’s complete with ‘separate opinions’ written by O.D. Corpuz and Haydee Yorac. Thank you Justice Sarmiento and the UP Press for publishing this!